French historian and archeologist; born at Fegersheim, Alsace, July 21, 1848. After passing through the Ecole Normale Supérieure he became professor of rhetoric at the lycée of Besançon. Subsequently he was a member of the French schools at Rome and Athens, and professor of Greek and Roman archeology at the University of Lyons. He is now (1902) in charge of the courses in ancient history at the Ecole Normale Supérieure. 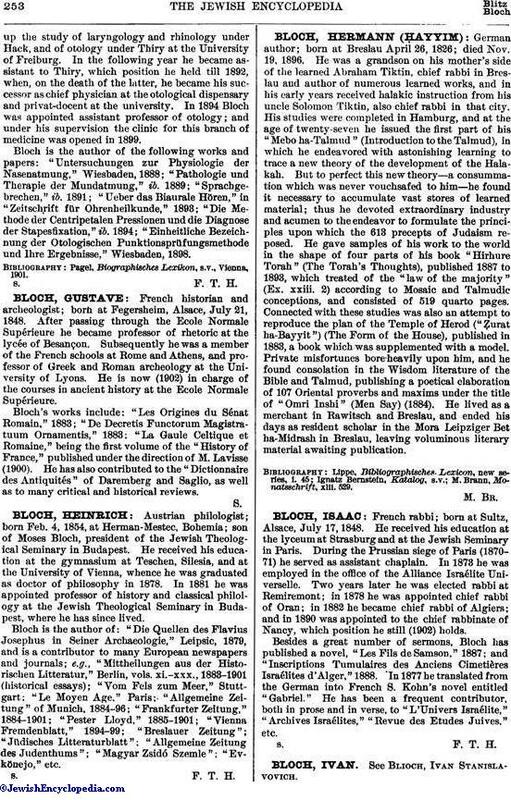 Bloch's works include: "Les Origines du Sénat Romain," 1883; "De Decretis Functorum Magistratuum Ornamentis," 1883; "La Gaule Celtique et Romaine," being the first volume of the "History of France," published under the direction of M. Lavisse (1900). He has also contributed to the "Dictionnaire des Antiquités" of Daremberg and Saglio, as well as to many critical and historical reviews.